See how it compares with the results from our Compassionate Organizations Quiz. Are you part of an organization—whether a workplace, religious congregation, or volunteer group—where people comfort one another and lend a hand when times are tough? Do your leaders seem to care about their members, and help with real-life challenges? The answers to these questions aren’t just important for feel-good reasons. Recent research suggests that more compassionate workplaces reap substantive benefits when it comes to employee wellness, creative problem solving, productivity, and the bottom line. In April, the Greater Good Science Center partnered with CompassionLab and the University of Michigan’s Center for Positive Organizational Scholarship to develop a Compassionate Organizations Quiz, asking readers about their experiences of compassion in an important organization in their life. Here’s what we learned. The kind of organization matters. 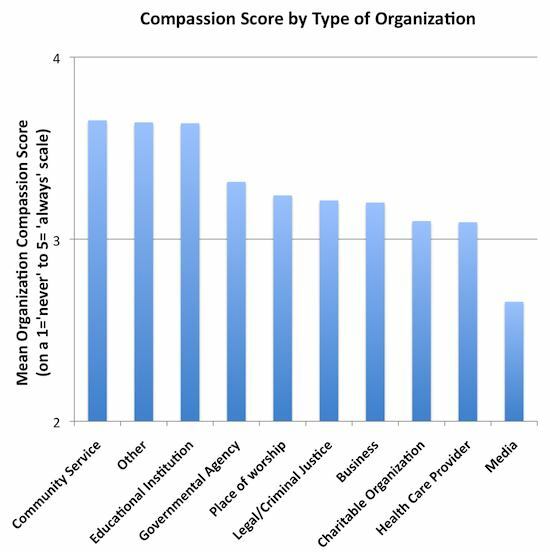 People in community service organizations and educational institutions rated their organizations as higher in compassion than people in other areas, including government, legal/criminal justice, business, charity, and health care. Curiously, people who chose “Other”—their organizations did not fit into any of the options listed—also reported more compassion. At the other end of the spectrum were media organizations, which ranked lowest in compassion. This finding is consistent with another recent study conducted by CareerCast.com; out of 200 careers that were rated based on factors such as stress, work environment, and salary, Newspaper Reporter was designated the worst job in America. Your age matters—and so does whether you have felt compassion from other people in your organization. 18-29 year olds and people over age 60 overall rated their organizations as more compassionate than people in other age groups. Though there were fewer survey takers across these age groups (approximately 200 total) compared to the 30-60-year-old range (approximately 800), this pattern suggests that people very early and very late in their lives harbor a more pro-social perspective toward the organizations they’re engaged with. There’s an alternative “bright future” interpretation, of course: that the younger generation is in fact more compassionate, and this bleeds into the organizations to which younger people belong. Then, the data show a drop for 30 year olds, which raises some big questions: Do their life circumstances—e.g., increasing career demands, new family additions, mortgage payments—make it harder for them to feel compassion, to extend compassion toward others, or to sense compassion from others? In a quiz like this, do people in their 30s become more likely to focus on their workplace as their “organization” as opposed to other, “extra curricular” organizations that may place more emphasis on care/support? Regardless of the reasons for the drop, we can take heart in seeing that compassion in organizations seems to slowly inch back up over the lifespan, eventually surpassing that level people experience in young adulthood. 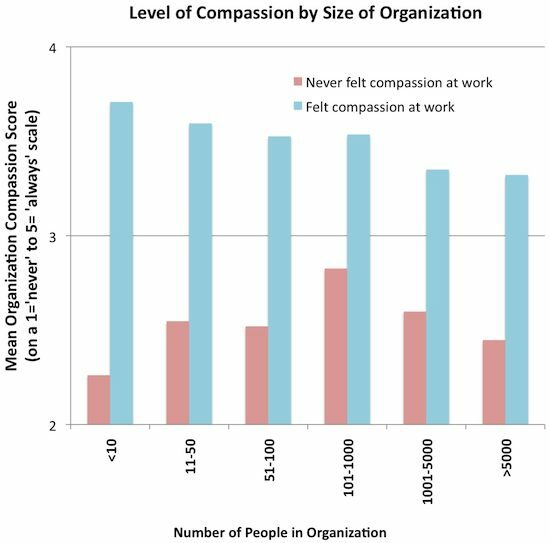 Another, perhaps unsurprising finding is that people who reported never having felt compassion from others in their organization rated their organization as less compassionate. For you to see your organization as compassionate, some co-worker has likely extended compassion toward you at some point or another. 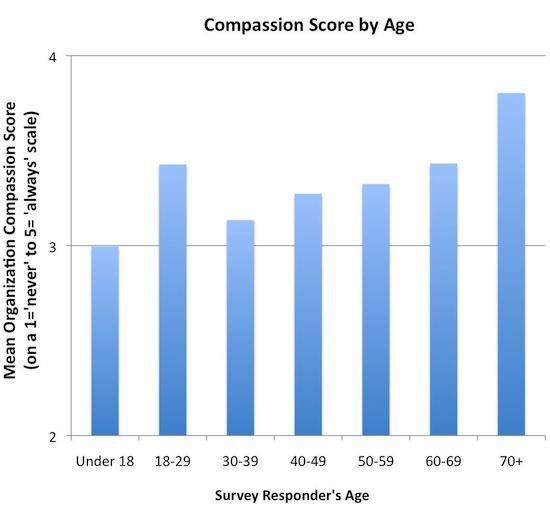 Interestingly, this “felt compassion” experience affected the relationship between age and ratings of organizational compassion: When we consider only people who never received compassion, 18-29 year olds gave the lowest compassion ratings. 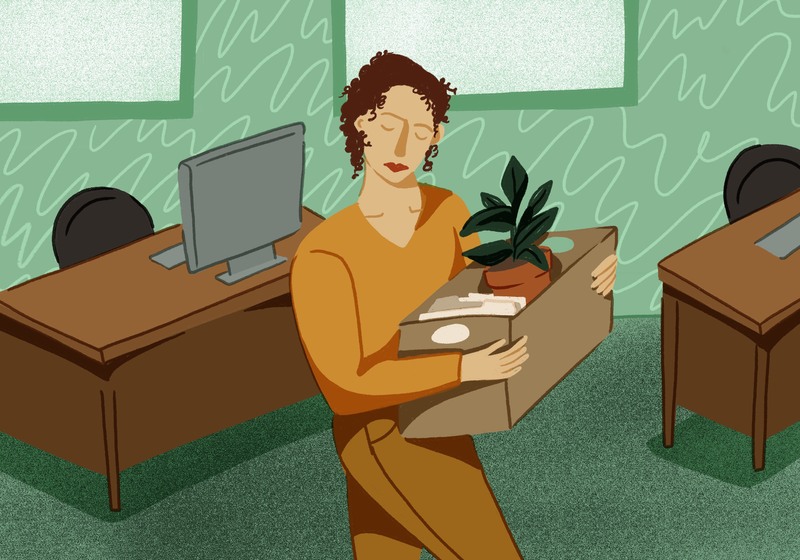 This could be a tragic story of wasted potential: Nurtured with compassion, young people readily embrace their workplace or other organization as compassionate; deprived of compassion, their perceptions of it plummet. The size of your organization matters. In general, people in smaller organizations—who probably run into one another, and talk about personal life details more often—reported greater levels of compassion than people in larger organizations. As we saw earlier, however, this pattern changes when we take into account whether people had been targets of compassion themselves. For people who had never felt compassion directed toward them, medium-sized organizations (those with 101-1,000 people), were rated highest in compassion, while the smallest organizations were rated least compassionate. While these findings merit further study, one possible interpretation of this data is that people in smaller organizations expect more compassion from co-workers than people in larger organizations, rendering a lack of personal experience with compassion more problematic in smaller organizations. If people haven’t experienced compassion in a smaller organization, that omission might sting more. Where you live might matter. While people in the American Southwest tended to rate their organization as more compassionate, geographical location did not make a big difference in general. This finding is interesting in light of the results of our Love of Humanity quiz, on which we reported last month. This quiz, which looked at readers’ tendency to extend a sense of common humanity toward people in their local communities, citizens of their own country, or people around the world, pointed toward a similar trend in the Southwest: Those residents tended to report greater love of humanity than quiz takers from other areas of the United States. Two factors we examined didn’t seem to have any systematic influence on peoples’ ratings of compassion in their organization: their gender and for how long they had been a member of the organization. Given certain cultural assumptions about gender differences in compassion (on which we reported last week), these findings suggest that gender does not systematically drive differences in how people experience and express compassion, particularly in organizational settings. Take our Compassionate Organizations Quiz--and learn about the benefits of compassion at work. And while we might assume that the longer people belong to an organization, the more intimate—and perhaps compassionate—their social dynamics become, these data suggest otherwise. There is no time limit for organizational compassion. The time is now! 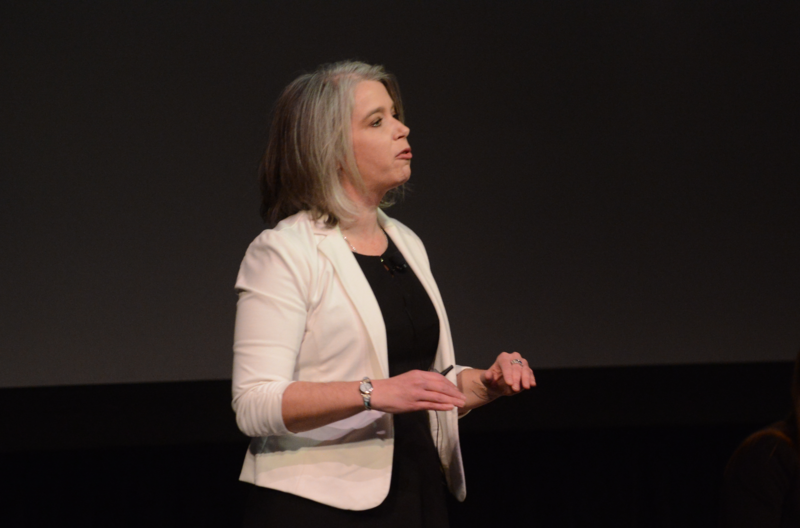 Overall, these quiz results begin to paint a picture of whether and where compassion figures into organizational cultures, and suggest how important it is for people to feel compassion from others in order to see their organizations as compassionate. Though compassion is a relatively new field of scientific interest, research increasingly associates it with improvements to health, psychological well-being, and interpersonal functioning. With that being the case, these results raise questions worthy of deeper scientific inquiry into how organizations might foster compassion and how compassion might benefit organizations, especially workplaces. Stay tuned for more from our colleagues at CompassionLab and the Center for Positive Organizational Scholarship on this important front.